"And my God will meet all your needs according to his glorious riches in Christ Jesus. To our God and Father be glory for ever and ever. Amen." Business as Mission (BAM) is not a technique or skill that one can master quickly. Rather it is a substantial change in perspective on work and business. It is a holistic worldview and lifestyle that integrates the Word and the deeds strategically in business on a long-term basis towards the advancement of the gospel on earth. BAM is not a stop gap for the funding shortage that traditional missions experience. BAM is not a means to an end, but in and through itself the gospel of God must be lived out. BAM is clearly a global movement. But it is not complete nor perfect. It still has many needs and gaps. The following article, prepared in 2009 by Mats Tunehag (Chairman of BAM Global), addresses this very issue and after eight years this article still remains valid and true. I trust you will find insights from this article. 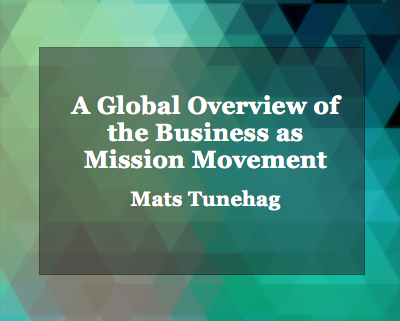 Business as Mission (BAM) is part of a wider global movement that recognizes and responds to God’s call to the whole Church taking the whole gospel to the whole person in the whole world.BAM is a relatively new term, but is based upon biblical concepts. The BAM concept is holistic in nature and content; it is built upon the truth that God has the power to transform people and communities spiritually, economically, socially, and environmentally. BAM does not accept the unbiblical and pervasive paradigm of a dichotomy between sacred and secular, where “church” or “missionary” work is considered a spiritually superior “full-time ministry” and doing business is considered less “spiritual”—or worse. In the last fifteen years the BAM concept has spread across the world and the number of BAM initiatives has grown dramatically. However, there are still major needs and gaps in the global BAM movement. This article will attempt to identify and briefly elaborate on a few of them. The following nine points can be used for prayer, discussion, planning, and action. WEC BAM Conference (October 14-16), Chiang Mai, Thailand Jeffrey met with WEC's leadership on BAM to explore the possibility of collaboration for the Kingdom. The meeting went well and we pray for a tangible and fruitful collaboration. SfK MBA Kigali II (October 30 - November 4), Kigali, Rwanda. SfK Ministries held its second MBA in Kigali in 2017, following one held in April. The training went very well with Jeffrey Lee, Sung Soo Kim, and Dan Mutiganda sharing the training responsibility. All 12 participants are committed to pass their learning to others in a constructive way. The participants have been carefully selected by Kigali Diocese of Rwanda Anglican Church so that they may develop their own training curriculum for the congregation members of hundreds of churches within the diocese. SfK Ministries will continue working with them in their journey. Nanuri Co. Ltd., Kigali, Rwanda. Currently, it is undergoing the the first of a three-phase development project. The initial phase involves the construction of a medical center and a guest house. Jeffrey shared a message on one of its weekly prayer meetings and participated in its board meeting to prepare for the upcoming completion of the construction and subsequent grand opening of two businesses. The Nanuri Community consists of a group of families and provides driving forces behind this company's ambitious project. Sky Bay, Thailand, Bangkok, Thailand, the implementing member of SfK Ministries in Thailand, continues to expand its business incubation activities while expanding its own SNS marketing programs. It organized the SFK MBA Chiang Mai and will be hosting the first business plan contest. It is also pilot testing the SfK Shared Accounting Service with the help of a Kingdom Fellow, Hana Lee, from Seoul Korea on its accounting capability. New Life Corporation, Bangkok, Thailand is a missional business that focuses on serving Thai nationals who worked in Korea and have since returned to Thailand. New Life desires to take a holistic approach towards caring for their spiritual needs through six churches in Thailand as well as economic needs through 14 cafes. They are also preparing to enter into the organic chicken farming business. SfK Ministries desires to work with them to establish, develop and position themselves within this market to produce synergy for the Kingdom of God. SfK Shared Accounting Service is still under pilot testing. We face some challenges, but with creative minds working together, we will be able to overcome them. SfK Life Board Meeting (November 10, 2017). Please pray that the board members will consider and decide all issues presented with God's divine discernment and wisdom. Strategic Planning Session (November 13-16, 2017) in Chiang Mai, Thailand. Two will come from Cambodia and one will come from Korea. Please pray that this strategic planning session will be fruitful for the Kingdom of God. Jeffrey's Travel to the U.S. (November 17 - December 22) - Jeffrey and his wife, Kristin, will visit Los Angeles, Denver, New York, Philadelphia and Atlanta. In addition to spending time with their children over the holiday season, they plan to share the activities of SfK Ministries and develop financial resources. For this trip, they will share with supporters a variety of products made by a few freedom businesses that rescue, equip and empower women entrapped in modern slavery including human trafficking. Please let us know if you want to host small gatherings in your living room to learn more about SfK Ministries. Please pray that their trip will be fruitful with inspiration shared with many people on the transformational power of missional businesses. SfK Ministries Business Plan and Strategic Plan - SfK Ministries has begun the process of preparing its business plan and refine its strategic plan. Please pray that this process will be handled with God's wisdom. Kingdom Fellows Needed - We all are blessed with God-given talents. You can participate in SfK Ministries even remotely using your God-given talents. Kingdom Fellows are fellow workers for God's Kingdom. They share the vision, mission and core values of SfK Ministries, and desire to love and serve God and His Kingdom by helping equip and empower missional businesses. These missional businesses in turn love, serve, equip and empower those around them and within their communities. You are invited to use your talents in equipping and empowering these transformative missional businesses. Please contact us at info@sfklife.org for more details. Until our next update about SfK Ministries and its transformational impact, we pray that God will richly bless you to be a blessing to many people around you!